You're hot and sticky. You've sweat pretty much everywhere. The one thing you crave is hitting that wall of cold air the minute you walk into your house and relaxing in it with a tall glass of ice water. You hit the wall of air, but it sure isn't cold. It's as hot and humid as the air outside. You have just experienced a failure of your HVAC system. Do you check things out and handle it yourself or should you call a professional? 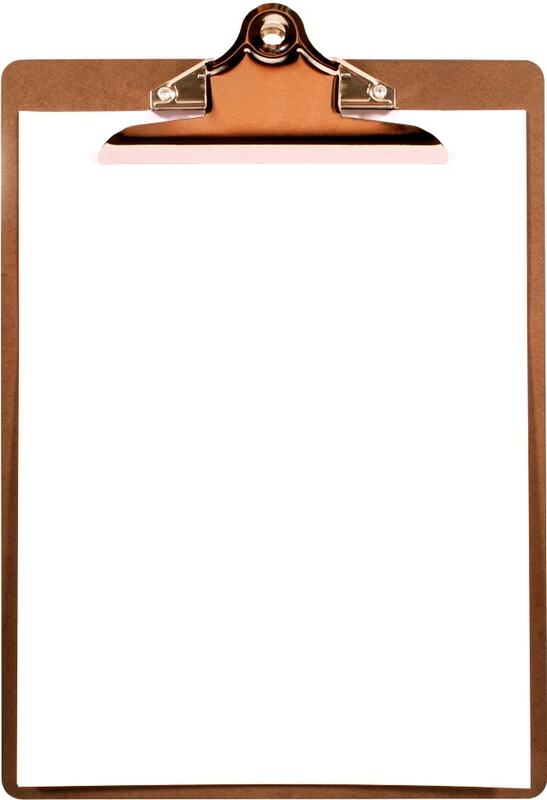 The answer to that question and many more you have about your HVAC system are just a scroll away. Keep reading to discover everything you ever wanted to know about HVAC systems and how to maintain them. HVAC stands for heating, ventilation, and air conditioning. Essentially, your home's HVAC is its temperature control system. It's what keeps your home cool in hot weather and warm in cold weather. 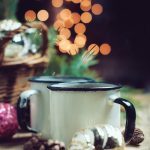 It is the saving grace on days when temperatures go super high or super low and keeps you from sweating it out or ending up with icicles for fingers. We use our HVAC system practically every day. And until they break down, we barely think about them. You should appreciate the modern HVAC system because, in the past, things weren't always so comfortable. The idea of heat has been around since fire was discovered. Early people probably built fires in their caves to combat the cold in winter. They huddled around it to protect themselves because they likely had experienced what happens when the human body gets too cold. Ancient people in Greece and Rome also appreciated warmth. They actually created fire channels that ran under marble flooring to provide radiant heat. These were like the low-tech version of today's radiant flooring. The Romans also had the hypocaust, which was similar to the central heating units of today that use radiant heat. They were on top of staying warm and toasty. Fun Fact: The Romans were the first to use a warm air heating system. The Egyptians didn't forget about cooling, though. They are famous for their man-powered fans. These early attempts were okay, but better things were on the horizon. Leonardo Da Vince continued with the idea of using a fan for cooling, but he didn't need to enslave people to make his fan work. It ran on water power. This century didn't really expand on heating. The focus was more on ventilation at this point. People had long been cooking with wood stoves and were getting pretty darn tired of smoke-filled homes. With the advent of the chimney, it meant the smoke could flow outside. Fans were also used to help remove toxic gas in mines, helping to make mining safer for workers. Chimneys came to America in the 1500s, and mines in France really began using fan technology, expanding on the previous decades' inventions. This century also brought the introduction of the gravity exhaust ventilation system. Plus, Galileo invented the thermometer. Finally, people had a way to tell just how hot or cold it was, but his thermometer wasn't really accessible to everyone. You've probably seen the modern version of a Galileo thermometer. Back in his day, though, it wasn't as easy for the average person to read. For that, people had to wait until the 1700s. We'll skip the 1600s because there isn't much that happened on the HVAC front, but in the 1700s inventors really got back into the swing of things. Daniel Gabriel Fahrenheit introduced the mercury thermometer in 1714. Now, when Aunt Tilly complained about being chilled, you could check the thermometer, see it was 70 degrees, and tell the lady to put on a sweater because you weren't about to fire up the wood burner. The first centrifugal fan ventilator came out of this decade, too. Benjamin Franklin invented the first steam heating system, and direct fired heat exchangers were first used in England. The 1700s also brought us the boiler system and hot water heating systems. Yay! No more heating pots on the stove and lugging them to the bathtub! By the 1800s, things were heating up. In 1861, William Siemens invented the electric furnace that had heated coils and fans. Fun Fact: While Siemens electric furnace may have been a thing in 1861, but electric in homes wasn't. By 1925, only half the homes in the U.S. had electric. The first blast furnace came in 1885 from inventor Fayette Brown. You could say the 1900s were a real boom for HVAC. So much happened that the whole concept of HVAC was forever changed. In 1902, Willis Carrier created air conditioning using coils, refrigerant, and a fan. However, it wasn't until 1906 when Stuart Cramer coined the term air conditioning. So, before then, I guess people called it the cool air thingy? Fun Fact: Because air conditioning hadn't been invented yet, schools started giving children a break over the summer because the schoolhouses were too hot. By the 1920s, people had air conditioning in their homes, but it still wasn't feasible for many people due to cost. So, it became huge for movie theaters to install air conditioning systems and use the cool air to entice patrons inside. Fun Fact: AC in movie theaters lead to the creation of Summer Blockbusters because so many people went to the movies in the heat of summer. AC was first put in vehicles in 1939, but it was such a huge hassle people really didn't want to deal with it. You had to get out of the car to turn it on and off. No thanks. I'll just let the wind cool me off. In the 1930s, J.Q. Sherman and H.H. Schultz invent window air conditioners to really help spread this invention to the masses. Fun Fact: Herbert Hoover installed AC for the first time in the White House. The 1900s also was when the heat pump became a thing. It was a more economical way to heat and cool a home. In 1998, due to environmental regulations, there was a need for a new type of refrigerant. So, the Carrier Corp introduced Puron refrigerant. By the end of the decade, solar-powered HVAC units were introduced to help save energy and make use of this renewable energy source. Renewable energy is still a popular idea. Geothermal energy systems are being introduced. Zoned systems. These let you control the temperature in each area of your home instead of having one control for the whole house. Talk about ideal comfort level. Plus, many systems are Wi-Fi enabled, and you can control them remotely through your smartphone. It really is the future. HVAC sure has come a long way since people used open fire to stay warm and hand-held fans to stay cool. The whole point of an HVAC system is that it works properly to provide you with a temperature-controlled environment. An effective HVAC system will keep your home cool in warm weather and warm in cool weather with proper ventilation for excellent indoor air quality, no humidity, and no dryness issues. To ensure effectiveness, your system needs the right components and set up to suit your home and needs. The source will be your furnace, boiler, heat pump, and air conditioner. 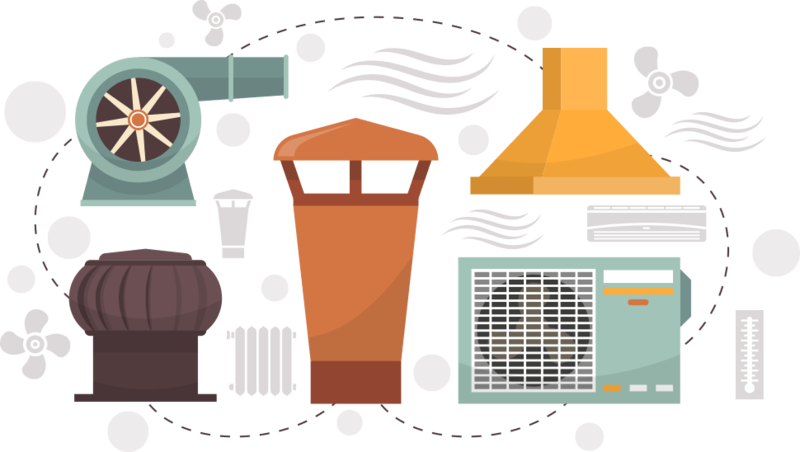 A furnace is a forced-air system that runs on electric, natural gas, propane, or wood. It blows air with a fan through vents in your home to deliver the heating. A boiler is radiant heating. You will have a radiator delivery system. A heat pump works in conjunction with a furnace. It will either take air from the ground, air or water and heat or cool it based on your needs. It uses your general heating system delivery method. Fun Fact: You can save up to 40 percent on energy costs by using a variable speed heat pump. An air conditioner uses a condenser and evaporator system to cool and remove moisture from the air that it delivers to your home. Depending on the type of air conditioner, it may use the same vents as your furnace or blow out directly from the unit using a fan. Fun Fact: A home feels cooler with lower humidity levels. This is another way air conditioning makes your home comfortable. Every system will also include proper ventilation. This removes air from your home, remove byproducts of the heating and cooling process, or filters the air coming into your home. Ventilation is usually built into the heating or cooling source. But the control panel depends on your system set up. Often it's mounted on the wall or the unit and allows you to set the desired heating or cooling level based on what temperature you want your home to be. Your system will surely include various other components, but may not include all of these components. For example, some systems don't include an air conditioner. And some may have a fan built in that you can operate independently of the furnace. Or you may not have a central unit that delivers heat but instead use electric heaters in each room of your home. There are many ways to design an HVAC system using various components. Just as all HVAC systems have the same general components, they also work in much the same way. The general concepts of heating, cooling, and ventilation do not really change. Here's an idea of how each element in an HVAC system works. 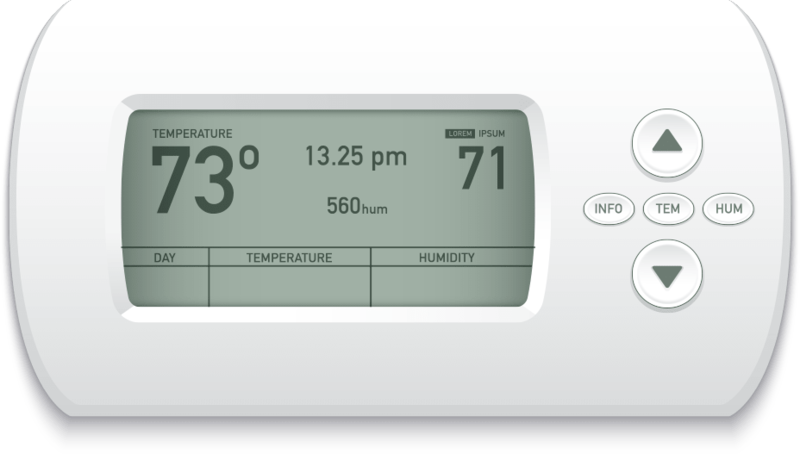 Controls: A control panel that allows for temperature setting for heating and cooling. May also provide fan control. Heating: Heating options are usually a furnace or boiler. A furnace uses vents that run throughout the home and blows air from the furnace into the vents with a blower fan. 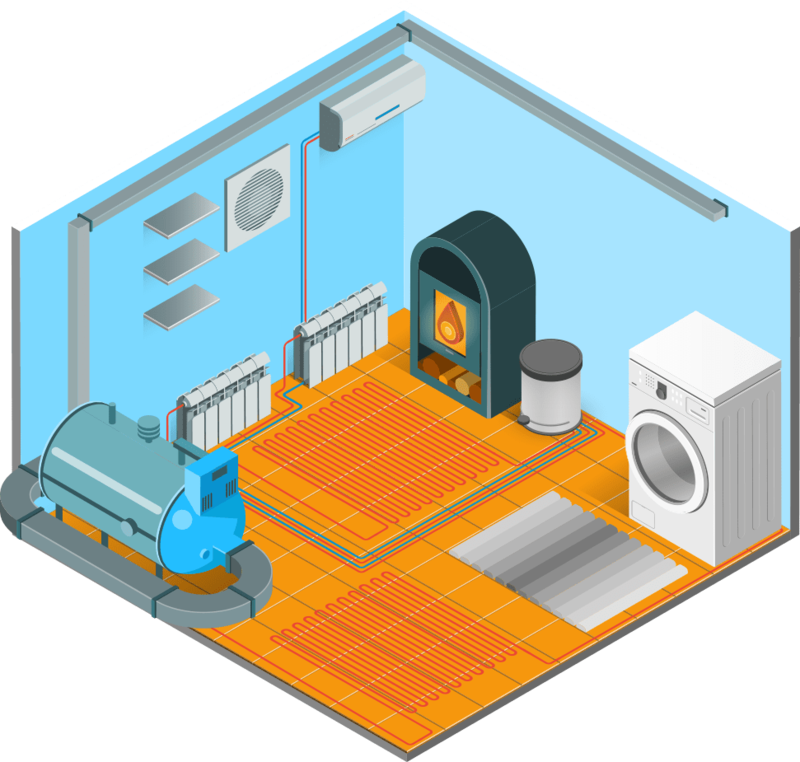 A boiler uses pipes that send heat to radiator units in each room of the home. Air Conditioning: Air conditioning removes heat and humidity from a home and introduces dry, cool air. 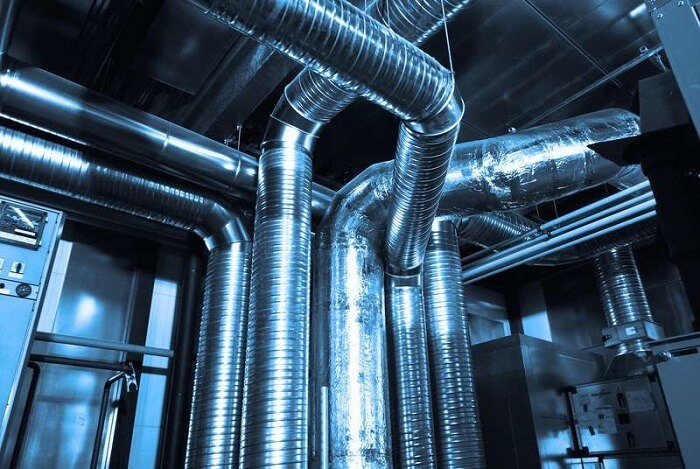 Ventilation: Ventilation is built into the heating and cooling units to remove hot or cold air and to remove byproducts of the heating and cooling process, such as carbon monoxide and smoke. It also includes things such as kitchen and bathroom exhaust fans and ceiling fans. Some systems may also remove allergens, dust, and dander. You can get the best possible HVAC system installed in your home, but it still won't last forever. Just as with a vehicle, you have to do HVAC maintenance on your HVAC system regularly to keep it running right. Fun Fact: Energy efficiency is a huge deal. Due to standards from the U.S. Department of Energy, from 1993 to 2003, people saved $29 billion on heating and cooling. You should get your HVAC system maintenance done twice a year. You want to do it before each major season, which is summer and fall. Pro Tip: Have your HVAC system maintenance in late winter and later summer to avoid the rush and ensure you can get an appointment. In addition to those two routine checkups for your system, you should also change the filter monthly or every three months, depending on your use. Here is a checklist of the tasks that should be done during the bi-annual maintenance. You should be aware there is not an industry standard for what is included in bi-annual maintenance. So, make sure to check your agreement with your technician to see what he or she is doing on each visit. 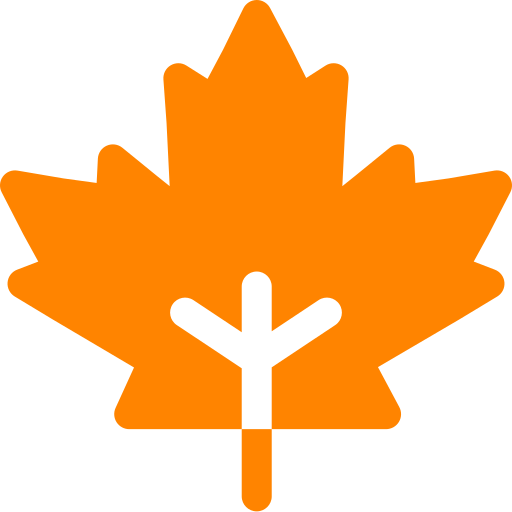 Typically, a technician will do some basic tasks each season. The technician will probably tighten electric connections, inspect controls, clean coils, lubricate as needed, replace worn parts and the filter, check the fans, check pressures, and verify the operating temperature. The technician will likely tighten electrical connections, inspect for leaks, clean the blower, clean the burners, inspect the ignition switch, clean the flue, replace any worn parts, and inspect the controls. You want to do regular maintenance to keep your furnace running properly and to avoid safety issues. Maintenance also helps to prevent costly repairs, lowers energy bills, and helps your system last longer before you need to replace it. Fun Fact: Proper maintenance can help prevent up to 35 percent loss of heat. Here's a deeper look at the benefits of regular maintenance. Your home will be more comfortable all year long. A properly running system is a safe system. Gas leaks or carbon monoxide build-up can be deadly. In addition, there is also the risk of fire in an unmaintained system. You'll find you have fewer repairs, lower energy bills, and the system will last longer. A good working system can remove contaminants more effectively. When you use less energy, it benefits everyone and everything on Earth. You have less exhaust from your system when it is working at peak performance and use less fuel. When it comes to maintenance for your HVAC system, you may wonder if you can do it yourself or if you should hire a professional to do it for you. If you have training and skills in HVAC, you may be able to do it yourself. Your best bet is usually to call in a pro. However, there are some tasks that you can DIY. Just make sure you understand the difference between those things you can do and when you need a professional. Working with gas and electricity is dangerous. If you try to do something that you do not have the skills to do, it could be a deadly mistake. In this case, it really is better safe than sorry. One of the things you can do yourself when it comes to maintaining your HVAC system is taking care of the filter. Not only should you change it regularly so you aren't running a system with a dirty filter but also you should consider using high-efficiency filters. The filter keeps dust out of the system. It ensures the system runs more efficiently and prevents breakdowns due to dust buildup. You can also keep the area around your unit clean. Dust, debris, and dander are no good when they pile up around an open flame. All it takes is one wayward spark to send your home up in flames. Also, pay attention to operating sounds. You can often tell if something isn't quite right by just listening to the unit when it's running. It's also fine to check things out visually. Look for damage or wear. Stay alert for odd smells, too. Gas leaks are nothing to play around with. But it can also be bad for other things, namely maintenance on your HVAC system. Professionals go through quite a bit of training to learn how to work on these systems. They learn about safety. Not only how they can stay safe while working but also how to ensure a system is safe to use. Making a mistake by trying to do repair work yourself can cost you big time. If you don't happen to get injured, you could break something and end up having to replace the whole system. Plus, most warranties are only valid if a professional technician works on the unit. If all that is not enough, you could also get yourself into some legal trouble. 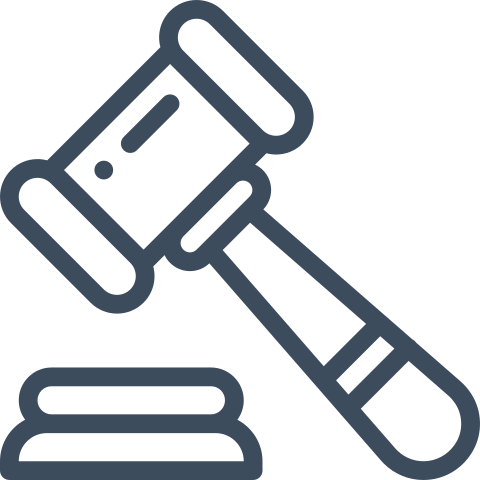 There are laws about handling refrigerant and working with other parts of the system. If you don't know the law or have the proper training or licensing, you could end up in jail for your DIY escapade. So, are you good and scared about trying to tackle HVAC maintenance on your own? That wasn't the point, but at least you understand trying to do it yourself is a risky move. You should call in a professional to do the bi-annual maintenance of your system at a minimum, but you may also call a pro to do any repair work, as well. When choosing someone to work on your HVAC system, make sure they are licensed to do so in your state if required. Legal Fact: Most states do require licensing for HVAC professionals. In states that don't, some local governments may require licensing. Also, check their experience. They should have years working on systems either as an apprentice in training or on their own. Make sure they are insured as well. You can also look for someone with certification from a professional organization, such as North American Technician Excellence. And it never hurts to get referrals and references, too. Don't hire just any old Joe off the streets, people! Whenever something is giving you a fit, you usually stop and think if it is worth repairing or if you should just buy a new one. When it comes to the HVAC system, buying a new one is a huge investment, so you need to think about this for a bit. Obviously, if you have a newer system, you will always go with repairing it over replacing it. If you're moving, ignore everything above and do a repair instead of replacing it. It usually is not worth it to replace the system as it won't help with the sale of your home or get you more money on your asking price. As long as it is safe, fix it and move on. We've covered a lot about HVAC systems. You probably know more now than you ever dreamed possible. Here is a look at some do's and don’ts when it comes to using and maintenance on your HVAC system. Keep these things in mind to ensure safety and efficiency. Okay. Now we are finished. Hopefully, you learned a lot about HVAC. It can be a confusing topic, but you know the basics now. Whether it is cold or hot, the chances are good that you just want a system that runs as it should. Nobody wants to hit the heat wall on a hot day or freeze their buns off on a cold day. Having a properly working HVAC system is all about maintenance. You need to find a professional and do your DIY tasks to keep your system in great shape. If you do that, you'll have many days of temperature-controlled bliss in your future. Have you ever had to replace your HVAC? Did you learn anything new today? Let us know your story in the comments! Staying cool in the summer is the number one priority for many homeowners. And you can guarantee that most of them are trying to find an efficient way to keep their families cool that costs less than their current setup. Whether you have central heat and air throughout your home, a window air conditioner, or are trying to keep cool by using fans, the hotter it gets outdoors, the more likely it is that you are trying to find a better way to stay cool. Are You Interested in Buying an LG Portable Air Conditioner? A good quality central heating and air system is perhaps the most efficient way to keep your home at the most comfortable temperature throughout the year. But if your system is no longer working, you’ve never had one installed, or if you feel it is far too expensive to operate, it is time to look for an alternate solution. Traditional window air conditioners can provide you with plenty of icy cool air, but they can only keep a single room or smaller area cool. Plus, they can sometimes be difficult to install or maintain. Fans are a good economical option as they don’t require as much energy as an air conditioning system, and window fans are a great option for bringing in cool air from outside. But they often don’t work as well as air conditioning as they leave you feeling hot and uncomfortable indoors. A good option that is both efficient and will help save you money on energy costs would be a portable air conditioner. These units can be placed in any room in the home to provide cooling power that is similar to a window air conditioner, but it uses less energy. You can move these units from one room to the next so that you can enjoy the cool air all the time. And they can also be less expensive than many other traditional air conditioning units. LG has made some of the best of these portable units that are currently on the market. There are several different models from the brands available for you to choose from. LG is one of the most trusted and top-rated electronics company in the industry. 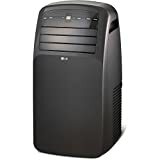 You can be assured that when you purchase an LG Portable Air Conditioner, you are buying a quality product. A portable air conditioner or PAC is a portable, self-contained system that is perfect for keeping single rooms cool and comfortable. These units often sit on the floor, and include an installation kit for set up, which is usually very simple and straightforward. Most portable air conditioner models will have wheels on the bottom to make them easier to transport from one area to another. This helps set these air conditioners apart from the traditional and stationary window units. An LG portable air conditioner will remove the warm air from the room and add moisture as it cools the space down. The warm air must be exhausted through another location, such as through a window. To do this, portable A/C units come with a window kit that usually includes a hose which vents the air outside. 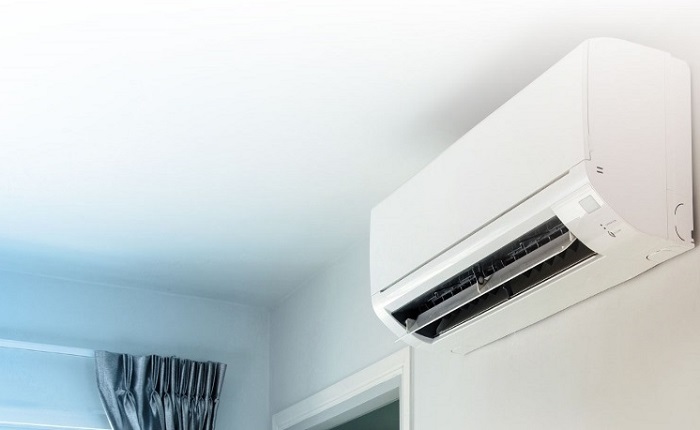 Depending on the model of the unit, there are also some portable air conditioners available that will connect to vents in the wall or through a vent installed in the ceiling. 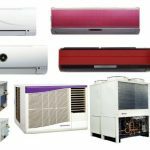 If you want to purchase a portable air conditioner, there are a few things to consider before you buy. A portable A/C unit ranges in price between $150 and $800. You can also find some that are more than $10k for commercial use. The wide range in cost is due to how powerful the unit is and how large of a space you need to keep cool. Some PACs will double as a heater, or they will include a dehumidifier. These additional features will also often run up the cost of the unit. The size of the portable air conditioner you choose will determine its portability. So, if you plan on using it in multiple rooms, you will want to find a smaller unit so that it is easier to carry. You will also need to think about the measurements of the unit and if it will fit in the space you plan to put it in. Another factor you need to consider before buying a portable air conditioner is the room size or space that you plan to use the unit in. Most PACs will display the square footage that it can cool on the box which makes it easy for you to narrow down your choices. Remember the more BTUs a unit has, the large the area that the air conditioner can keep cool. LG has several models of portable air conditions available for you to choose from, here are some of the top-rated PACs from LG. The LG LP0817WSR Portable Air Conditioner is an excellent choice for keeping a single room or small space cool. This AC unit includes a convenient remote control and is capable of keeping a 150sq. foot space comfortable during the summer. This unit features an auto evaporation system and uses a standard 115-volt/15 amp electrical outlet for power with a 6ft. long power cord. It also includes a window installation kit and is available in either White or Graphite Gray. The LG portable air conditioner can cool a room with up to 1.8 pints per hour of dehumidification. The top of the unit is inclined to allow for air discharge. The auto swing louvers assist in eliminating hot spots in the room. This LG portable air conditioner is currently available to purchase on Amazon for $279. The LG LP1215GXR Portable Air Conditioner includes an LCD remote control and is ideal for larger rooms and spaces up to 300 square feet. This unit uses a 115V electrical outlet. It dehumidifies up to 1.2 pints per hour and the dehumidification function mixes cool, dry air with warm air to help keep you and your family as comfortable as possible. The unit is available in black and is between 7000 and 12000 BTU. The unit’s oscillating air vent technology allows it to prevent hot spots within the room. This LG Portable Air Conditioner is currently available on Amazon for $395. 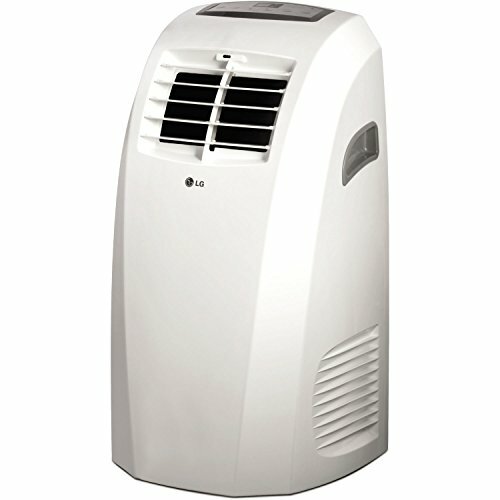 The LG LP1015WNR Portable Air Conditioner with Remote Control is ideal for rooms or spaces that are 250 square foot. This unit uses a standard 115-volt/15 amp electrical outlet and has a 6 foot power cord. The operating modes for this portable air conditioner include cool, fan-only, and dry. The dry mode on this LG air conditioner can help to remove as much as 2.6 pints of moisture in the room per hour. Additional features include a 24-hour programmable on and off timer that allows you to control the temperature in any room in your home, even if you are not there. 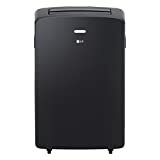 This LG Portable AC Unit is currently available on Amazon for $329.99. The LG LP0817WNR portable air conditioner features a sleek design and is capable of cooling rooms or spaces up to 200 square feet. Available in White or Black to match your home décor, this air conditioning unit comes equipped with an auto evaporation system. It uses a standard 115-volt 15 amp. Electrical outlet and features an easy-to-read LED display panel that you can use with the included LCD remote control. This unit will cool your room with up to 1.27 Kg/Hr. dehumidification. The top of the PAC allows for inclined air discharge with automatic swing louvers which work to reduce hot spots in the room. This Portable Air Conditioner by LG is currently available to purchase on Amazon for $$. 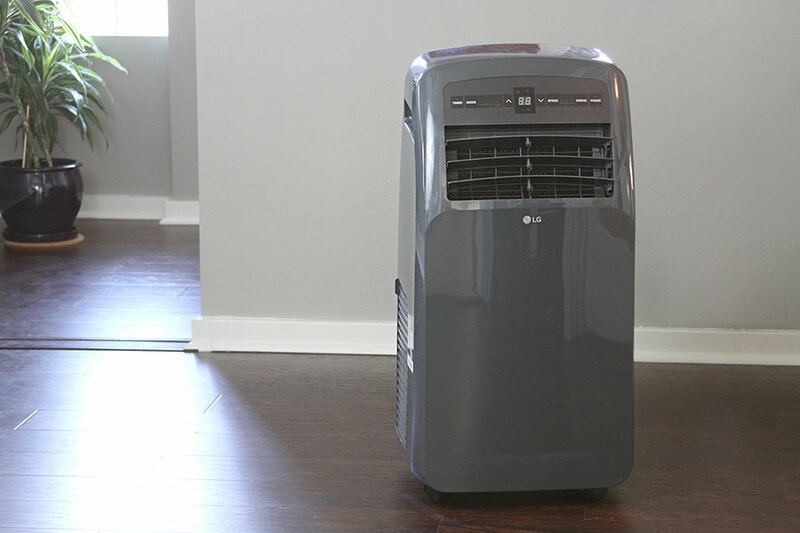 The LG LP1217GSR Portable Air Conditioner will make a great addition to your 300 square foot room or space. This unit includes a remote control and is available in a striking graphite gray. It features an automatic evaporation system and uses a standard 6 foot long 115-volt power outlet. This air conditioner operates between 7000 and 12000 BTU. It can cool a room up to 300 square foot with up to 2.6 pints per hour of dehumidification. There are several good reasons why you should purchase a portable air conditioner for your home. Here are some of the benefits you can expect. A portable air conditioner allows you to keep a single room such as a bedroom or open space like your living room cool without disrupting the temperature in other rooms throughout your home. If you prefer to keep your bedroom cool but want the other rooms in your home to be warmer, you can accomplish that by using a portable air conditioner. When you use a portable air conditioner, you no longer have to cool down your entire house just to keep one room or area just the way you like it. If you have family members who prefer the temperature to be a few degrees cooler than everyone else in the home, they can keep their room colder by using one of these convenient units. These air conditioning units from LG include modernized features such as built-in 24-hour timers and remote control functions that allow you to do more than you ever could with your central heating and air system or with a standard window A/C unit. 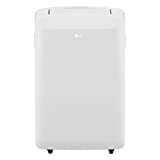 These portable air conditioners are much easier to relocate from one room to another than a standard window air conditioner. They are lightweight and very easy to install. Most come with a window installation kit so that you don’t have to buy any extra equipment to use them. Just take them straight out of the box, set them up, and they are ready to use. If you feel like buying an LG Portable Air conditioner is the best choice to help keep your home cool and comfortable, there are plenty of top-rated models for you to choose from. LG is a very reliable brand that is recognized as an industry leader in both electronics and home appliances. You can be assured that you are purchasing a reliable and dependable product when you buy a brand new portable air conditioner manufactured by LG. The A/C condensation drain line, which is usually either a 1/2″ or 3’4″ PVC pipe that extends from the attic to an outside wall near the condenser, enables water and moisture to exit the A/C unit during the refrigeration process. It is typically characterized by a slow drip when the A/C is in use. However, due to its function, location, and dark, cold environment, it can also become a breeding ground for algae as well as bug and critter nests, which over time can cause blockage in the drain line and an overflow in the drain pan, which can leak and damage drywall in the ceiling. One telltale sign that your A/C drain line is clogged is that the fan on the outside unit may continue to spin, but you may not be getting much air from your unit. In which case, you can use the following tips on how to unclog ac drain line in attic to see if it helps. A small funnel for pouring liquids. 1/2 of gallon bleach for flushing and disinfecting. A shop vacuum for removing clogs. A thermometer (optional), for recording A/C temperatures. As a safety precaution, always shut off power to the A/C unit before making adjustments or repairs. In the attic, locate the main drain line. It is near the blower motor and usually just below the secondary drain line. Many drain pans have a secondary drain pipe that enables water to exit the system to the outside, usually by way of a second drain pipe located on the upper outer wall, to protect against drain overflow. Furthermore, since the secondary drain line only kicks in when the main drain is clogged, it’s also another telltale sign that the main drain is clogged when precipitation is exiting from the secondary drain pipe located on the outside wall. Remove the removable cap or plug on the main drain pipe. It is usually located at the top of the drain line. Or, it may be located further down the pipeline on a threaded tee. Next, insert a small funnel into the main drain pipe to prepare it for flushing and cleaning. The funnel will help prevent spillage as the disinfectant is poured down the pipe. With the funnel securely positioned into the drain pipe, slowly pour a half gallon of regular household bleach down the drain. The bleach itself will kill any existing algae, while the odor will help freshen the pipe as well as deter unwanted bugs and critters from making their home in the pipes. This is especially useful during colder seasons when the unit is not in use. For a chemical-free alternative, you could simply use white vinegar. However, though vinegar is effective at killing algae, it may take longer to remove clogs. Simply pour six ounces of white vinegar slowly down the drain. Repeat every few months to keep the drain clear. Once you have flushed the drain from the attic, next, place a shop vacuum over the outside drain hole to suction out any blockages. Or, you could simply run a fish or wire clothes hanger down the drain to help clear the blockage. For how to unclog ac drain line in attic involving more stubborn clogs and buildup, you may need to repeat steps 5 & 6 a few times to clear the pipe. Repeat the process until the main drain line is clear and water no longer trickles from the secondary drain line. Place the cap back on the main drain line, and then turn the A/C back on. You should notice that the fan inside the outdoor unit is spinning and air is now coming out. You should also notice water exiting the main drain line in a steady drip. Allow the A/C to run for about 15 minutes on the desired temperature setting. Afterward, if you’d like, simply check for accurate temperature with a thermometer. To record the temperature output, simply point the thermometer at the supply register closest to the inside A/C unit; it will give you a digital temperature reading. If the temperature is off, it may be time for an A/C tune-up. When incorporating these tips on how to unclog ac drain line in attic, be sure to follow the manufacturer’s safety recommendations to avoid damaging your system. When working with chlorine bleach, it is also a good idea to wear protective clothing. Use a plastic apron, eyewear, rubber gloves, and maybe even a face mask to avoid damaging your clothes, irritating your skin, and breathing in harmful fumes. Keeping your A/C drain line clear is imperative for an efficient working system to help keep your home cool and also avoid damaging your ceiling, which can cave during drain pan overflow and lead to costly repairs. To keep your A/C drain clear, it is recommended that you use these tips on how to unclog ac drain line in attic at least once a year. 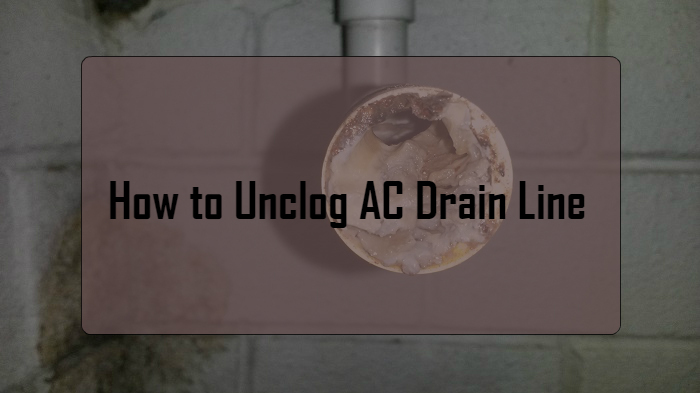 If only your social media friends also knew they could keep their A/C running efficiently this summer and their ceiling intact with these tips on how to unclog ac drain line in attic. After trying these tips on how to unclog ac drain line in attic, be sure to inform us of your experience. AC Frozen Inside: Why Does It Happen and What to Do About It? If you have noticed that your AC unit doesn’t quite cool your home the way it used to, or it is working harder to cool your home, which can also increase your energy bill, an AC frozen inside could be the problem. 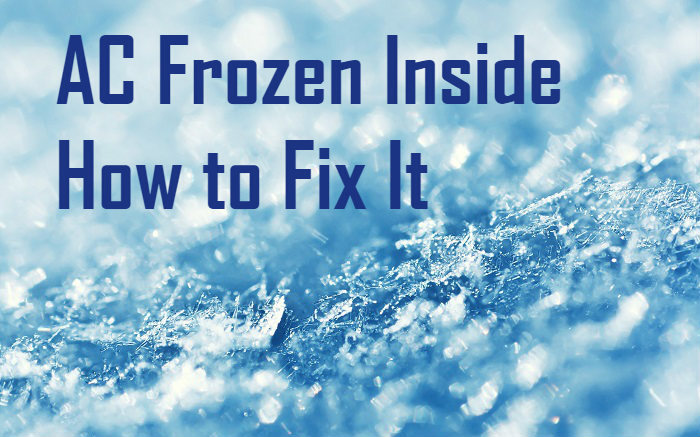 An AC frozen inside can be caused by a number of components, which this short tutorial will help you troubleshoot. An AC frozen inside can cause a lack of airflow, which can make your unit blow out warm air or struggle to cool your home. When this occurs, it can cause premature wear on your unit as well as increase your energy bill as the unit works harder to perform its function. If you notice that after running the A/C unit for some time, it freezes up or stops working altogether, ice buildup could be to blame. An AC frozen inside literally causes ice to form on the unit’s interior parts, which blocks air to the system and in turn can cause it to stop working. Low airflow to the A/C unit causes a decrease in temperature inside the system, so when moisture in the air collects on the unit’s components, it can create ice buildup on both the inner and outer parts of the A/C. Never attempt to remove ice from your system by picking or scraping it off with a sharp object because it could damage the parts and lead to costly repairs. Instead, simply turn off the system and wait for it to thaw, or turn on the blower to allow it to thaw, before troubleshooting it. When troubleshooting your system, you will need to access the system’s inner parts. Therefore, you will need a set of nut drivers and sockets to remove the panels to inspect the parts. A soft brush, such as a toothbrush, can be used to remove debris from a dirty air filter, which can hinder proper airflow to the system and cause it to freeze up. It can also be used to gently remove debris from the evaporator coils, which can also cause the A/C to freeze up. There are two main causes of an AC frozen inside, which include low refrigerant and restricted airflow to the evaporator coils. First, turn off the AC, and turn the fan setting on to allow the system to thaw. Place dry towels around the unit to prevent water damage. Remove the access panel to the evaporator. Inspect the coils and the cooling fins surrounding the evaporator. If they have debris on them, gently brush it off using a soft brush. Check the filters in the cold air return inside your home or in the AC’s plenum to see if they are dirty, which can restrict airflow to the system. If they are dirty, simply clean them gently with a soft plastic brush or replace them if they are beyond cleaning. To effectively cool your home, the AC needs the right amount of refrigerant. However, over time, wear and tear on your system can lead to refrigerant leaks, which can cause the temperature of the coils to decrease and eventually cause ice buildup. Therefore, inspect in and around the system for visual signs of refrigerant leaks, sometimes they can also cause a soft hissing sound. If you find any leaks, simply contact a professional HVAC technician to repair the leaks and then recharge your system. Be sure the A/C supply registers in each room are open. 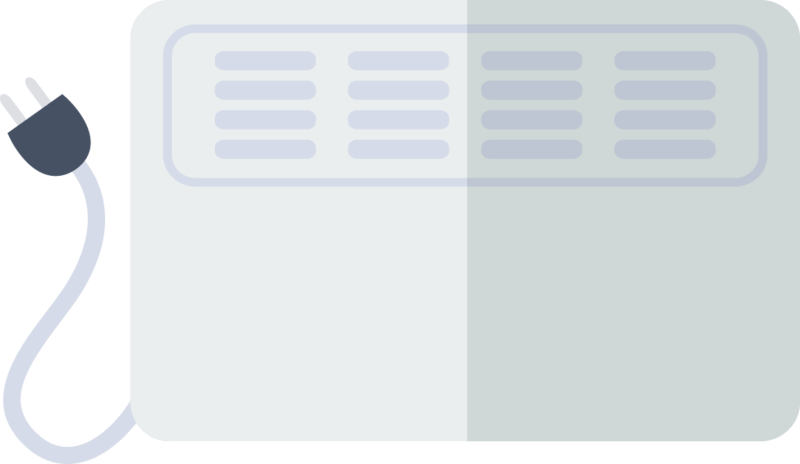 Blocked registers restrict airflow, which causes the temperature inside the unit to decrease. Turn the A/C back on and allow it to run until it reaches the thermostat setting. If the air still feels warm, the unit still struggles to cool your home, it continues to shut off, or you still notice ice build up on the unit, contact a professional HVAC technician for repairs. The Wrong Size Ducts – Sometimes the wrong size or number of ducts can cause restricted airflow, which can also cause your system to freeze up. The Wrong Size Condenser – The condenser size, or BTU’s, is determined by several factors regarding your building, including the size of the building, how hot the building is, the amount of insulation is inside the walls, and the type of windows. Therefore, if you have the wrong sized condenser for your needs, it can cause the system to freeze up. A Bad Blower Motor – Consistent use and high heat can cause the blower motor on the A/C to burn out, which can cause your unit to freeze up. Working with refrigerant, which can be a gas or a liquid, requires a licensed professional, so when dealing with refrigerant leaks and repairs, be sure to contact a licensed professional for help. To prevent premature wear and tear on your A/C, which can cause it to clonk out before its time, and to help keep your energy bills low, don’t put off AC frozen inside repairs. 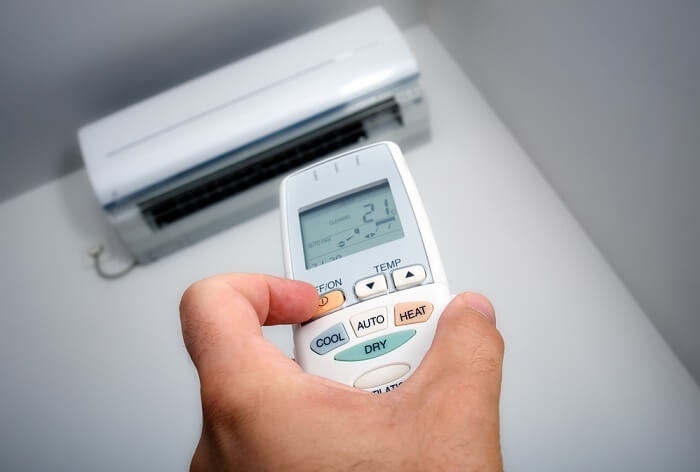 Instead, use this short guide on what to do about AC frozen inside to troubleshoot the issue, and then make the repairs that you can yourself to help save time and money. If you like saving time and money on troubleshooting your A/C issues, wouldn’t it be great to share the excitement with your Facebook or other friends? And be sure to share your experience with these troubleshooting tips with us too! There is nothing more annoying than your air conditioner failing to work in the middle of a heat spell. In such circumstances, you may have to wait for days before an HVAC technician can repair your unit. 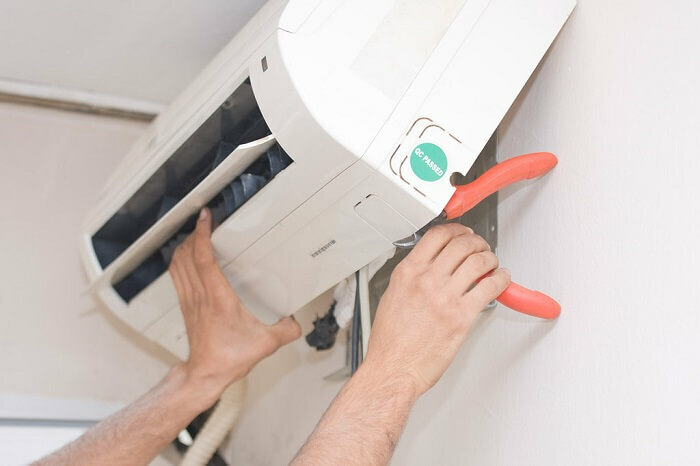 In most cases, air conditioners repairs should be handled by HVAC technicians, but there are simple repairs you can do yourself with a little air conditioner troubleshooting. This guide will explore some of the most prevalent problems and how to fix them. Apart from parts that you may need to buy depending on the nature of repair required, you also need to have working tools. Here are most of the tools that you need to complete your DIY project. At least 2 insulated screwdrivers. If your air conditioning system fails to start, there could be a range of potential causes that you need to check out. First, check if the condenser is running, then confirm if the thermostat is set properly and make sure the AC is plugged in. One of the challenges could be the setting on the thermostat. You can start air conditioner troubleshooting by lowering the thermostat to 5 – 10 degrees and observe if the unit will work. Another potential problem could be the fuse. Check if the fuse is blown. If not, then check if tripped circuit breaker or loose wiring is the problem. To test the fuse, you need to set your multimeter to a lower Ohms scale then place the black and red leads on the opposite ends of the fuse. Zero, infinity symbol, or minus reading indicates a blown fuse. A blown fuse could also be a sign of failure in the condensing unit. You may also need to inspect internal part of the access panel. The best way is to follow the electrical conduit to find the access panel. After putting the power off, you need to check if the electrical wires and connectors are intact. If there is any chewed insulation, fix them if you are comfortable with electrical repairs, otherwise, engage a professional. Besides this, you may need to replace the capacitor and contactor. These items can degrade with time. If you replace the fuse and it blows up again, or if the unit won’t turn on after you have done the above replacements, or if the coil is frozen, the problem could be the compressor or motor. At this point, it is best to contact your HVAC professional to fix the problem. Even if the thermostat settings are correct, your AC system may still fail to work. A potential problem could be the system has a blocked air condenser, or it is dirty. The first step is to make sure all the register are wide open and the furnace filter is clean. You can then clean the unit from outside to remove any weeds or debris that may be blocking the free flow of air. You also need to check the filter. Oftentimes, the filter may accumulate a lot of dirt, which may prevent the flow of air to the evaporator coil. So, as you carry out your air conditioner troubleshooting, you can test if your filter is working by seeing through it. You should change your filters at least once a month if you are constantly using your AC unit or if you have pets. If the filter is working, and your AC still fails to work, then the problem could be linked to the refrigerant or compressor. One of the problems that you will deal with in your air conditioner troubleshooting is refrigerant leaks. If your AC unit is low on refrigerant then there are two potential dangers. The unit might be undercharged at installation or the refrigerant is leaking. The refrigerant is the fluid mixture that keeps everything cold. To fix refrigerant leaks, you will need a trained technician. These leaks can be harmful to the environment. According to Energy Saver, your air conditioner functions optimally when the refrigerant is charged according to manufacturer’s specifications. Another potential culprit that may prevent your AC unit from working is leaking or dirty ducts. If you are getting warmer air than you expect, then there could be a problem with ducts. Generally, the central air conditioning system is well sealed, however, the ductworks that run through the ceilings and walls could develop leaks due to poor workmanship or rodents. If there are leaks in the ducts, the cool air will escape before reaching your room. Part of the air conditioner troubleshooting could also involve checking the window seals around the AC system to ensure hot air is not getting in. Besides checking for leaks, you should also need to regularly clean your AC unit, for instance, replacing filters on a monthly basis, cleaning the condenser and evaporator coils, and clearing the drain lines at least two times a year. Before you start fixing anything on your air condition system, ensure you have turned off the power. Turn off the power at the breaker box inside then do the same to the exterior shut-off box close to the exterior condenser. If you are not sure about a specific situation, especially the ones that touch on the electrical and the core of the system, please involve a professional. If there’s one thing that you need to remember from this discussion on air conditioner troubleshooting is to have a routine maintenance plan. Even if the above troubleshooting doesn’t work, at least you already covered most common problems. So, your HVAC professional can focus only on the elusive challenges. Moreover, when you fit new parts on your AC unit, you are extending their lifespan as well as reducing chances of breaking down. If you have successfully completed DIY AC repair recently, we will be happy to hear about your experience in the comment section below.